Swami Priyajitji visited the centre on an inspection tour. He spent time with the patients of the centre and interacted with them all. Swamiji conducted a knowledge session and also a short meditation. He spoke to many patients and was very happy with the arrangements in the centre for the recovery of the patients. He was happy about serene atmosphere in the centre and encouoraged the management and staff to carry on with their noble work. Rudra Puja was performed at the centre with all the rituals and customs. Members of the Art of Living family, guardians of some patients and few people from the local public attend the puja. All staff members and patients of the centre were also present. Special arrangements were made for the day. The puja was well appreciated by all present. Such occasions are regularly organised in the centre for the benefit of the patients. A team of two members from Japan visited the centre to spread the message of peace and harmony. The members of the team interacted with the management staff and patients of the centre. They also conducted a short meditation session in the presence of all the patients, who were benefitted from this visit. The members from Japan highly appreciated the good work being done by the centre to help people overcome substance abuse. Along with the rest of the world, this day was observed by V.V.M.D.R.C. by organising a 3-day kiosk at Topsia area of Kolkata city, in association with Kolkata Police. The 3-day event started off with a street rally. Participants of the rally were school children, local public, officers from Kolkata Police, volunteers of V.V.M.D.R.C. and people from other walks of life. The kiosk which was put up, provided information to the general public about the maladies of drug and alcohol abuse and its after-effects. Along with the kiosk, a free councelling camp and a free health check-up camp was also arranged for the benefit of the local public. A presentation by Serum Thalasemia Prevention Federation, West Bengal, quiz and drawing competitions among school children were also done during this 3-day event. The local public greatly benefitted from this noble event and was very well appreciated by the local people. To oberserve the International Day Against Drug Abuse and Illicit Trafficking, V.V.M.D.R.C. participated in the kiosk provided by Kolkatat Police in Sealdah Railway station in Kolkata. Awareness about drug and alcohol abuse was conducted through public announcement system and distribution of leaflets. A musical programme was also organised in the event. Following up with the awareness training initiated by V.V.M.D.R.C, an awareness programme was organised in Joynagar, West Bengal, near Kolkata city. Volunteers and councellors of the centre gave a stage presentation to create awareness among the local population about the maladies of drug and alcohol abuse. The event was organised by two YLTP youths who undertook the awareness training in V.V.M.D.R.C. 5 councellors of Legal Aid Services, West Bengal, visited the centre to know about substance abuse, their ill effects and the treatment provided. The team interacted with inmates and staff of the centre. At the end, a musical programme was performed by inmates of the centre. The councellors were very happy with the atmosphere of the centre and assured to promote the name and good work being done by the centre among the general public. 18 nursing staff and their In-charge Lt. Col. R. Mohanemlal visited V.V.M.D.R.C. The team interacted with the management, staff and inmates of the centre and they were very happy with their experience at the centre. The comment about the centre written by Lt. Col. Mohanemlal is "Me along with 18 students from Command Hospital, Eeastern Command, visited the centre. It is a very pleasing experience. Very good ambiance and very motivated staff. We wish them all the best." 12 volunteers of V.V.M.D.R.C. donated blood at a camp organised by Art of Living, Dum Dum, Kolkata, on the occasion of Guruji's birthday. The gesture of the volunteers was very well appreciated by the organisers of the camp. 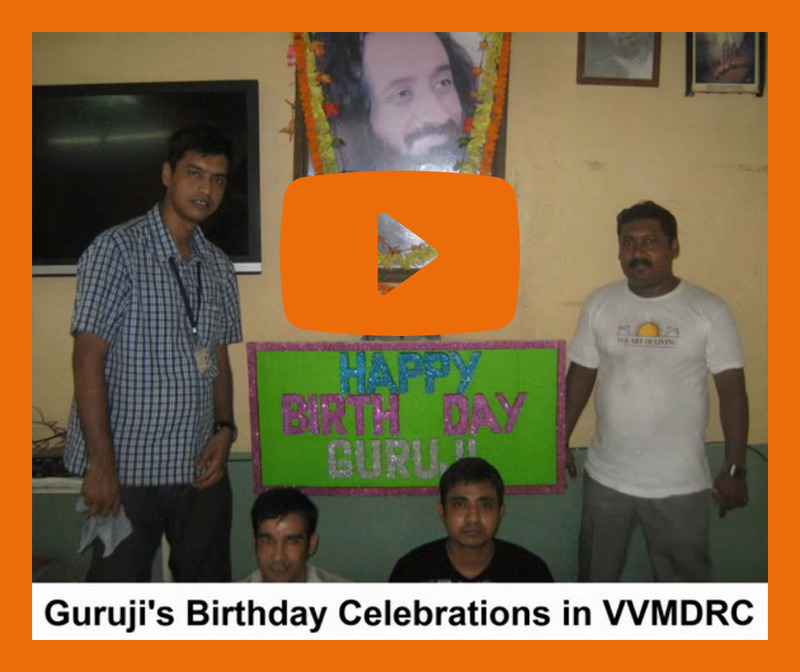 As per tradition, the birthday of Guruji was celebrated in V.V.M.D.R.C. with a lot of activities planned for the entire day. Along with the regular activities, meditation was conducted by the resident Art of Living teacher in the morning and evening. A Mega Satsang and fun time was arranged in the evening along with special food for everyone at the centre. The president along with another member of the Rotary Club of Kolkata Innercity visited V.V.M.D.R.C. and had an informal meeting with the management of the centre. Total of 90 nos. of bed-sheets were donated by them for use in the centre. The visitors were received well and were very pleased with the facilities available at the centre for treatment of patients. A pioneer initiative of training YLTP youths to organise Awareness Programmes in urban and rural area of India against substance abuse has been started by V.V.M.D.R.C. The first training programme began on April 2013, which was a residential 6-day programme and is being organised on a regular basis with emphasis on the logistical convenience of the centre and the trainees. Each batch of trainees consists of 6 youths. Our trainers visit the respective area of the YLTP youths to help them, initially, to organise awareness programmes. Volunteers of V.VM.D.R.C. performed in a satsang organised by West Bengal Khatick Mahasabha. The volunteers performed well and it was well appreciated by the members of Art of Living who were present at the Satsang. Holi was celebrated in the centre along with the rest of the country with a lot of fun activities and special food for the persons in the centre. All the inmates participated in the programmes and thoroughly enjoyed the day. Volunteers of V.V.M.D.R.C. organised an awareness drive in Kharagpur to create consciousness about the maladies of drug and alcohol abuse. During the day-long drive, the volunteers visited the susceptible areas of the city including the slum areas, markets, railway & bus stations, IIT Kharagpur, etc. Guruji visited the new centre of V.V.M.D.R.C. in New Garia, Kolkata, for laying the foundation stone, which is under construction. Several volunteers of V.V.M.D.R.C. and members of the Art of Living family were present to welcome Guruji. He inspected the area and new site with boundary wall and was very satisfied with the planning and development of the new project. A day-long picnic was organised for the inmates of V.V.M.D.R.C. in a nearby location. All inmates were taken from the centre to the venue. Amusement activities like music & dance, singing, games, personal sharing, good food, etc. were arranged. The event was very well enjoyed by all. Along with the rest of the country, V.V.M.D.R.C. observed the Republic Day of our country. The day started with the hoisting of the national tri-colour and singing of the National Anthem. Special arrangements for entertainment activities and food was organised for the day. MLA of Howrah Sri Ambika Banerjee, Bengali film stars Soham and Payel, Commissioner of Police A. M. Ranade, IPS, Project Incharge of V.V.M.D.R.C., Sri T.K Banerjee were present among the dignitaries. A Drama was also organised which deals with addiction related problem in our society. Five volunteers of V.V.M.D.R.C. participated in the Drama. The awareness programme was organised at Nehru Children Museum which is affiliated by Govt. of India. More than 500 people attended the seminar where many children were present along with their parents. A Power Point presentation was made and it was well received. Nearly half an hour was spent on question & answer session. The whole programme was conducted by few recovering patients, counselors & Project-in-Charge. A new video filming was done on de-addiction centre for men and women and also on Panchakarma centre connected to it. Since the quality of this film was good it was selected in the recent film festival at Kolkata under the short film category. In a compact hall the film was shown and was appreciated by the crowed of the hall. 10 Boys from our De-addiction centre, led by our project In-charge attended the Annaji's Rally at Park Street, Kolkata to show the solidarity on Annaji's anti-corruption movement. VVMDRC celebrated 15th Aug 2011 & 26th Jan 2012 with all the boys. The flag hoisting ceremonies had been done by both old patients and newly admitted patients. Special food arrengment was made for those days. Health Camp attended by VVMDRC (invited as volunteers). The Health Camp was organised by Howrah Police & Lions Club of Calcutta with the help of Local Clubs and VVMDRC. There was huge participations. In collaboration with Kolkata Police, a 3 days awareness campaign was conducted at Kolkata near Ekbalpur Police Station. VVMDRC's boys & Ahalya's girls actively participated in the event. Individual and group songs were performed. Also street drama was conducted by VVMDRC boys. We received 2nd prize from the Commissioner of Kolkata Police for the VVMDRC's representation and arrangement of the Kiosk. 25 volunteers from V.V.M. De addiction Center spread around different parts of the area as specified by Iqbalpur PS. Regular announcement from Kiosk on the Ill effects of addiction in Hindi, Bengali, English. Visits to nearby school and educational institutions to create awareness on addiction and HIV /AIDS. Supported by Iqbalpur PS. Leaflet distribution on major street corners, shopping area, bus stops, traffic intersections, and Including the Local clubs into this campaign with support from Police. Leaflets – in Hindi, Urdu, Bengali, English languages were printed, Banners, slogans and flex backdrop for Kiosk along with required Decorations were arrenged. Kolkata Police supplied T-shirts, caps, banners, leaflets which were displayed and distributed as instructed. Kiosk and related items were also supplied by the Kolkata Police. Activities as done daily plus attracting Moving Public by recovering addict street children who are attached to RUPAYAN a street children project under Art of Living. Moving into gullies as directed by Kolkata police and with the help of local clubs to spread awareness in slums and LIG settlements. Special additional activity which the Kolkata police wanted to do from this Kiosk or within the command area. Rally involving school children with anti drug slogans in and around Iqbalpur Thana area only from 10.AM to 11AM because of excessive heat. Special Programme announcement, Plus on the spot counseling for families and co dependants of addicts or alcoholics. Programme on AIDS/HIV. and its prevention educating general public and substance users on the role of risky behavior under Influence. How substance abuse leads to risky behaviors and crime (Kolkata Police), Intro before the Play. Played in Hindi on Drug addiction 'Janzeer' followed by Songs on the same theme. Quiz competition with participation of local school children (K.P. to identify). Drawing competition involving small children from local schools. Prize distribution in the evening By DC port and sending message to general public about Addiction related Crime and awareness among general public on preventing early use among children. Film on Drug addiction and how to come out of the same "Born Again" in the Kiosk with TV and DVD player. 6 boys from VVMDRC were invited to a school awareness campaign against Drug and Alcohol in Jagacha area, Howrah, for sharing their own views regarding substance abuse and its ill effect on the individual, family and society at large. The programme was highly appreciated. On 8th January 2012, Guruji visited VVMDRC. All the staff members and inmates were blessed by His Holiness. At the end of his visit, Guruji felt very happy and expressed his happiness during the Mahasatsang in Dumurjala Stadium, Howrah. Guruji distributed prasad with blessing to all the inmates present in the meditation hall. A consent was given by Guruji to increase the number of patients and to acquire a bigger area for De-addiction & Rehabilitation activities. Some contents of this website are sole properties of VVMRC, any copying or reproducing them may need permission.